Maryland is continuing to lead the way with innovative approaches to oyster restoration. Here oysters are being placed to improve the fishing at a popular fish pier. Oyster reefs can host 100's of other species, many of which are food sources for larger fish desired by sport fishermen including striped bass. One study showed that oysters could triple the number of fish. It is particularly interesting to see that they will be tracking the increase in fish caught at this location. We reprint this article below. The sun sets over Bill Burton Fishing Pier. The Chesapeake Bay Foundation, the Maryland Artificial Reef Initiative, and the Maryland Department of Natural Resources have finished construction of an oyster reef alongside the Bill Burton Fishing Pier. 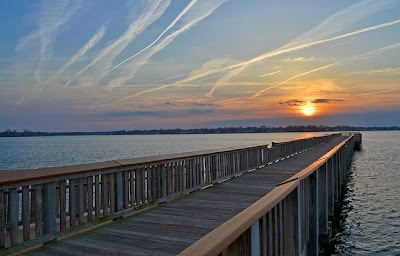 The pier is adjacent to the Fredrick C. Malkus Bridge, which connects Talbot and Dorchester counties. The completion of the reef in the Choptank River was celebrated on the pier by a crowd of anglers, families, and state, city and other officials. 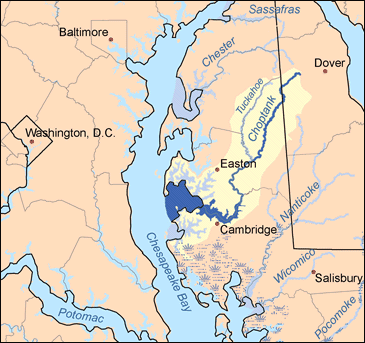 The Choptank River feed the Chesapeake Bay and is the largest river in the DelMarva Peninsula. The reef was created by placing 300 concrete “reef balls” on the bottom of the river, immediately alongside the fishing pier. The two-foot tall, igloo-like reef balls were built by volunteers at CBF’s Oyster Restoration Center and by volunteers from the Maryland Saltwater Sportfishing Association. All 300 were “set” with baby oysters (spat) by submerging them in large tanks of Bay water at the ORC and adding millions of oyster larvae spawned at the Horn Point Laboratory near Cambridge. 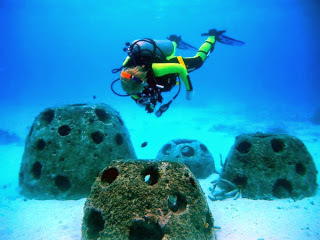 Diver hovering over reef balls. Patricia Campbell, CBF’s specially designed oyster restoration boat, deployed the reef balls throughout the summer, and placed the remaining 60 in the river last Saturday as the public looked on from the pier. 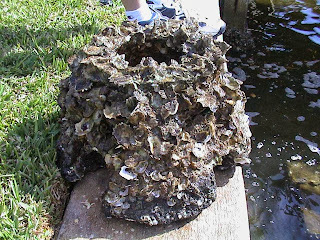 Following the reef ball placement, the crew of Patricia Campbell overplanted them with one million “spat-on-shell” oysters produced at the ORC. Reef Ball covered in oysters provides shelter for the food chain that feeds sport fish. Reef balls act as an artificial structure upon which oysters, mussels, barnacles and other benthic organisms can attach. 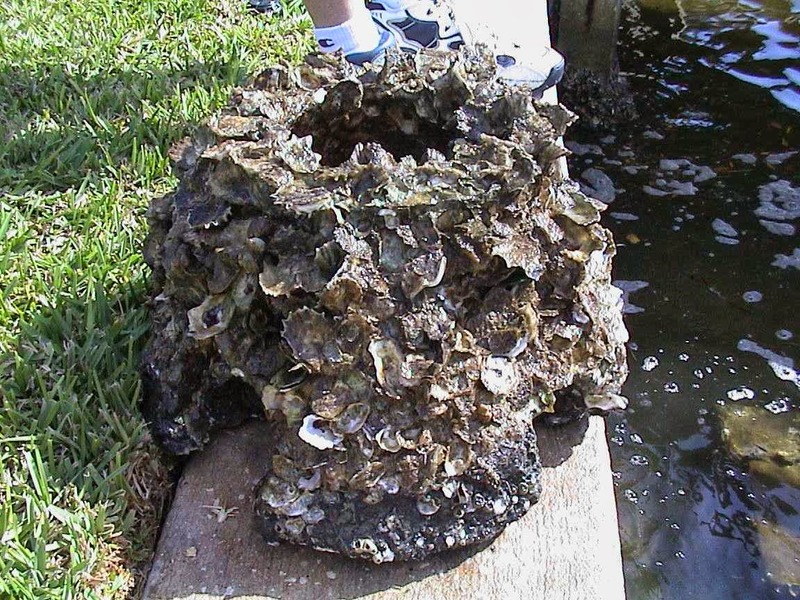 Oyster shells are the normal substrate to which these species attach, but shells are in short supply. The three-dimensional artificial reef also serves as a habitat for fish like striped bass, sea bass and croaker and for crustaceans like blue crabs, mud crabs and grass shrimp. “This should help the fishing community experience good fishing …. It’s available to the public. 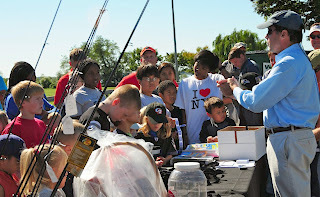 You don’t need a boat to fish it,” said Clint Waters, president of the MSSA’s Dorchester Chapter. The Bill Burton reef will be one of the most accessible oyster and fish reefs on the Eastern Shore. With the help of MSSA volunteers, the DNR and MARI are tracking the number of fish caught in the area, both before and after the reef’s construction to document the reef’s benefits as fish habitat. The dedication celebration included fishing demonstrations, opportunities for the public to add oysters to the reef, guess-the-number-of-oyster-spat sponsored by the Midshore Riverkeeper Conservancy, and hotdogs by Easton Ruritan.